Hello and welcome to the inaugural Movie of the Week! Our goal is simple, post movies that we love and hope you haven’t seen so you’ll eventually become film snobs like us! This week’s offering is “Eastern Promises” (David Cronenburg, 2007) starring Viggo Mortensen and Naomi Watts. The film follows David Cronenberg’s recent trend towards psychological drama and stark realism, away from his imaginative and gory science fiction/horror films such as “Crash” and “The Fly”. Far from conventional, “Eastern Promises” gives us a brutal tale of family ties and redemption in this modern crime thriller that still gives a few nods to Cronenberg’s famous style. This is Mortensen and Cronenberg’s second film together after 2005’s “A History of Violence” and before 2011’s “A Dangerous Method” which also stars Michael Fassbender, and are both equally enjoyable and gripping films. An unknown Russian teenager dies giving birth, leaving only her infant daughter and her journal in the hands of her midwife Anna (Naomi Watts). In her search for answers she stumbles upon a mystery deeply embedded in the Russian Crime syndicate of London, guarded by the enigmatic mobster Nikolai (Viggo Mortensen) and the vindictve boss Seymon (Armin Mueller Stahl). Anna’s quest for justice is paralleled by Nikolai’s rise in the Russian crime syndicate, and we see the depths of horror that both must experience to reach their goals. It’s a wonderfully written crime drama with breakout performances by post-“Lord of the Rings” Viggo Mortensen as the jaded hitman (who received an Oscar nomination for his role, but lost to Daniel Day-Lewis for “There Will Be Blood”), Armin Mueller Stalh as the reserved but ruthless Seyman, and Vincent Cassel as Seymon’s incompetent son, Kirill. Bear in mind that almost every player in this film acts in their role at or above par, however, Mortensen and Stahl are the real attention-grabbing spectacle. Both of them carry a weight of masculine brutishness that make them dominate any situation or conversation, while still being genuinely scary criminals. Naomi Watts offers a sobering conviction to the callousness of her male co-stars, one which she plays with calmness and passion. Part of the Cronenberg’s mastery demonstrated in the film is his ability to make a study in visual symbolism (one that potential cinematographers ought to take a keen look at). One of the dominant images in this film is the explicitly tattooed bodies of the Russian criminals, most notably from Mortensen (on whom much of the visual marketing of the film is based). On one of the DVD extra’s, Cronenberg and Mortensen explain the supposed history behind the tattooing and Russian crime, where tattoos are indicative of one’s life story and criminal history. When watching the film, the viewer can notice so many visual and idealogical cues that are spurred by body art. Cronenberg, a master of bodily distortion, handles the subject in a number of interesting ways. There is a number of points in the film where tattooing becomes like a second skin for many of the film’s Russian characters. In one brilliantly shot scene, a naked Nikolai is put on trial by the heads of the crime syndicate, where the tattoos serve as “evidence” for his entry into the family. This plays on the film’s on-going themes of identity and redemption, where the characters must always question whether they can atone for their transgressions or whether they are permanent, like the sting of a tattooing needle. While being so far in his career, David Cronenberg shows that he can still experiment with imagery and narrative, even into his old age (he was 64 at the film’s release). The film gave many Cronenberg fans an indication of the new direction his films had taken- a turn away from bodily horror and towards psychological themes. Still, the film has been hotly received by fans and laymen alike, many of whom have named it among the best of 2007. Don’t take it from us, though. Watch the film yourself! 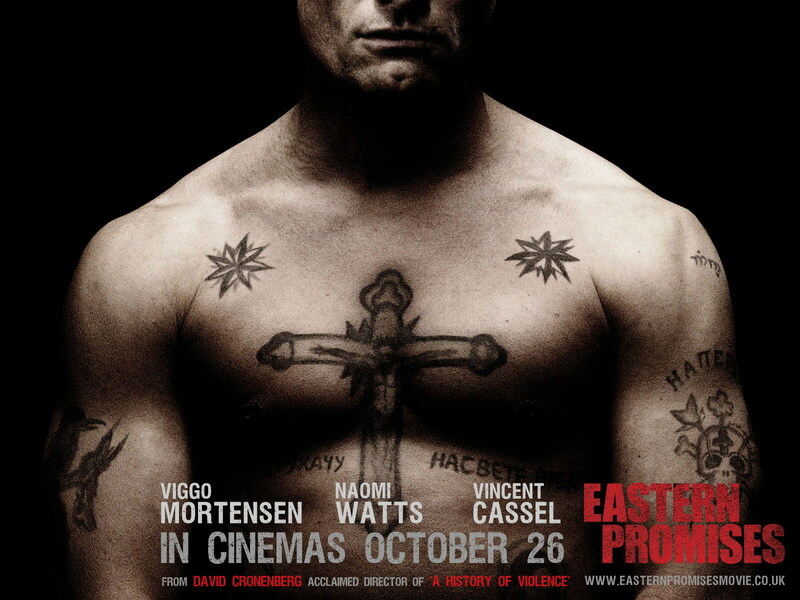 There are currently no comments on Movie of the Week: “Eastern Promises” – A Sinister Promise. Perhaps you would like to add one of your own?